At 12noon on 29 October 1880, the Wells Lifeboat Eliza Adams was launched to the aid of a laden Brig Sharon's Rose which had been seen to run ashore at Holkham beach in a heavy sea and severe gale. The lifeboat succeeded in rescuing the crew of seven and returned, its crew drenched and exhausted, to Wells. On arrival at Wells Quay, a second vessel was seen to the East of the harbour entrance flying a distress flag. The Brig Ocean Queen was riding at anchor in a very heavy sea. 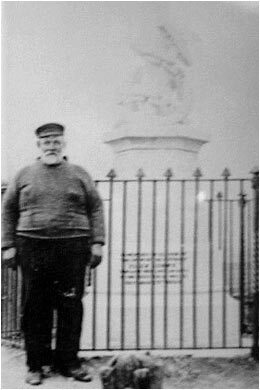 After a change of eight of the crew of the lifeboat, it was immediately towed to the harbour entrance by the Steam Tug Promise, and released around half a mile from the Ocean Queen at about 3.30pm. By now, Ocean Queen had parted its cable and been driven onto the East sands. With the vessel aground on the lee shore, it became apparent that the lifeboat would be unable to render any assistance and the order was given to set sails to return to the harbour. 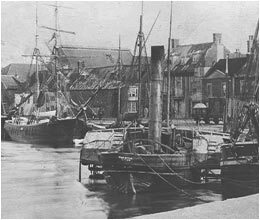 The steam tug Promise at Wells, circa 1880. Around fifteen minutes later, a large sea broke over the lifeboat, capsizing her and driving her mast into the sand, preventing the lifeboat from self-righting. Twelve of the crew were washed from the boat and eleven lost their lives. One of the two survivors remained in the boat, tangled in the lines until the mast snapped and the boat finally righted itself. The other survivor managed to lay on the boat's rudder before being washed ashore. The eleven crew that were lost left ten widows and 28 children. The Ocean Queen managed to survive the storm. The wreck dried out as the tide ebbed that evening and her crew of six were able to walk safely to shore. The Institution voted £1000 towards a fund raised locally for the dependants of the lost crewmen and paid their funeral expenses. A memorial was built to commemorate the disaster. This has recently been restored and can be seen at the start of the beach road, opposite the old lifeboat house. Ten Lifeboatmen lie in the Churchyard at Wells, and not a stone marks the place where they lie. I am the only survivor out of thirteen; eleven drowned and two saved. Seven men were saved from the Sharon Rose, of Whitby, and then the Lifeboatmen were called out a second time to rescue the crew of the brig Ocean Queen, of Sunderland. These brave men left their wives and children to return no more, and ten widows and twenty-eight young children were left to mourn their loss. One brave man the sea never gave up. Such a long time has passed since this sad occurrence that I feel I must at last appeal to the public for help to raise a memorial to these brave men who perished while doing their duty. They had English hearts, and I hope the public will do them honour for their brave act.